Recipe from my aunt, perhaps available somewhere here. Cheesecake. I know, so eighties. This one, however, knocked my socks off. I recently visited my beloved aged aunt in New Jersey. Age has not diminished her cooking. She’s the kind of relative whose food turns out to be as good in your adulthood as you remember it being in your childhood. I probably acquired my love of cooking from her. If anything is responsible for the cheesecake’s fall from favor, I attribute it to the graham cracker crust. A shortbread bottom crust sets this cheesecake apart from all others I’ve eaten. The cake is creamy and light. The shortbread base stays firm to the cut of a fork. This recipe will make you nostalgic for the luscious sort of cheesecake that we all used to make in the ’80s. Position a rack in the middle of the oven and preheat to 350 degrees F. Butter the bottom of the springform pan and line with parchment or waxed paper. Set aside. Shadowcook: I took this to mean: cut a circle of parchment or wax paper and place over the round buttered bottom of the springform pan. To make the base, beat together the butter and sugar by hand until light and fluffy. Beat in the yolk until smooth. Combine the flour, baking powder, and salt. With a rubber spatula, gently fold into the butter mixture. The mixture will be crumbly. Shadowcook: You’ll probably have to gather it into a ball of dough with your hands. It will easily fall apart. Don’t overwork it. Remember, this is a crust that does not go up the sides of the cake. Place the dough in the pan and use your hands to pat it down evenly and firmly over the bottom. Bake for about 25 minutes, until the crust is golden and baked through. Transfer to a rack and reduce the oven temperature to 325 degrees F.
To make the batter: In the bowl of a heavy-duty mixer fitted with the paddle attachment, beat the cream cheese on the lowest speed just until smooth, no more than 30 seconds. Stop the mixer and scrape down the bowl and beater. Add the sugar in a stream, mixing for no more than 30 seconds. Stop and scrape again. Add 1 cup of sour cream and mix only until it is absorbed, no more than 30 seconds. Repeat with the remaining sour cream. Add the eggs one at a time, mixing only until each is absorbed; stop and scrape after each addition. Beat in the vanilla extract. Shadowcook: I suspect the reason for Malgieri’s insistance on underbeating rather than overbeating is that the cake is less likely to set firm during the baking the more you beat the batter. So, even if there are lumps, err on the side of underbeating the batter. Wrap heavy-duty aluminum foil around the bottom of the springform pan so it comes at least one inch up the sides. Pour the batter into the pan. Place the pan in a jellyroll pan or roasting pan and pour warm water into the pan to a depth of 1/2-inch. Shadowcook: I used my big rectangular pyres baking dish and I poured in boiling water around the cake pan higher than 1/2-inch. Bake the cheesecake for about 55 minutes, or until it is lightly colored and firm except for the very center. Remove from the oven and lift the cheesecake out of the hot water. Remove the foil and let cool completely on a rack. Wrap the cheesecake and chill overnight. Shadowcook: Expect some condensation to form under the surface of the wrap. To unmold the cheesecake, run a knife or thin spatula around the inside of the pan pressing the knife against the pan, not the cake. Unbuckle the pan side and lift off. Leave the cake on the base, or run a spatula under the cake base and slide the cake onto a platter. Shadowcook: A few hours before serving, I roasted about 2 cups of hazelnuts in a 350 F oven. While they were still warm, I put the nuts in a tea towel and rubbed them vigorously to get the skins off the nuts. Then I took a kitchen mallet and crushed them into pieces. 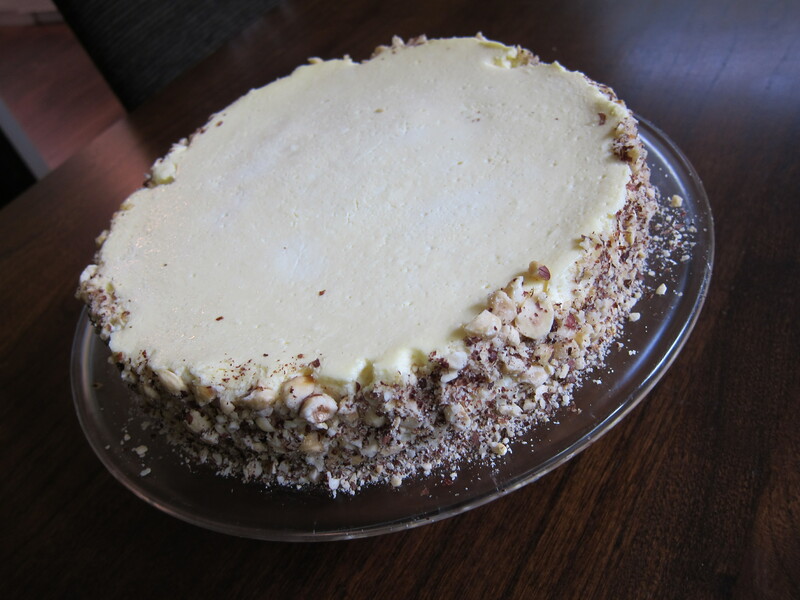 Using a long, thin spatula, I applied the crushed nuts around the side of the cake. Then I put the cake back in the refrigerator to set. Pingback: Someone who knows cooking utensils? Its a matching game :P?